One of the leading service providers of Mobile Recharge Software. Offering Multi Recharge Software is known for its superior precision and user friendly nature. 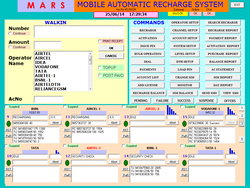 Mobile Automatic Recharge System (MARS) is a PC based system that enables Mobile & Dth (Tv) Recharge Wholesalers / Distributors / Dealers to Setup their own all Mobile & Dth (Tv) Recharge Business, they can extend their services through Dealer and retailer (remote agents) the remote agents registered with the system can send recharge requests to MARS through a simple SMS. Remote agents do not need E-recharge SIMs or GPRS handsets. Recharge is carried out automatically by the system after receiving the requests and responses are sent back through SMS. MARS is highly configurable and provides a host of powerful features to extend your reach, grow your recharging business and manage it better. Server Model is expandable by adding nodes. The Server and nodes will be networked through LAN. A maximum of 1 server and 24 x 4 nodes can be connected supporting 96(Ports) SIMs. It is possible to buy a stand-alone system first and then convert it to Server module later. 32 SIMs Tray SMS Modem. 16 SIMs Tray SMS Modem. Instead of loading Lapu balance in bulk (Rs. 50000) in one sim, purchase the same balance in 4 sim and divide the balance equally i.e. 12500 in 4 sim, modem switches the lapu sim automatically after completion of the specified balance. Looking for Mobile Automatic Recharge System ?